Are dogs really better than cats? Is sunshine better than rainfall? Encourage your child to develop his own opinion for various topics with these persuasive writing prompts. He'll be convincing you in no time! 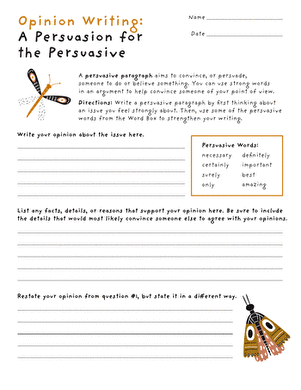 Looking for a worksheet to help your kid with his persuasive writing? This printable will help him with his writing skills.